[Updated Feb 2016] Ensure no hungry bellies this Chinese New Year. 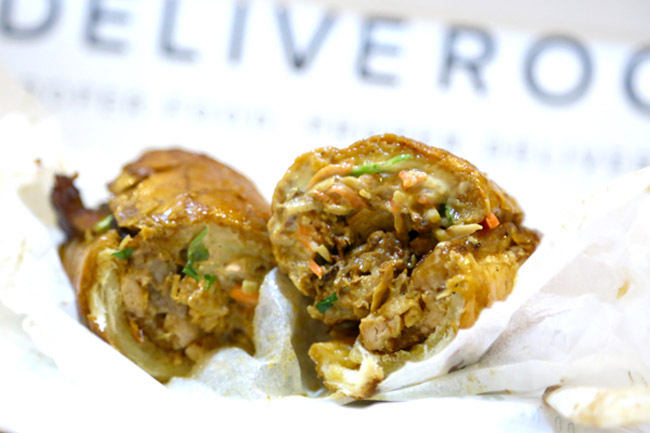 Deliveroo is running a FREE Delivery promotion during the first 2 days of CNY (8, 9 Feb 2016). 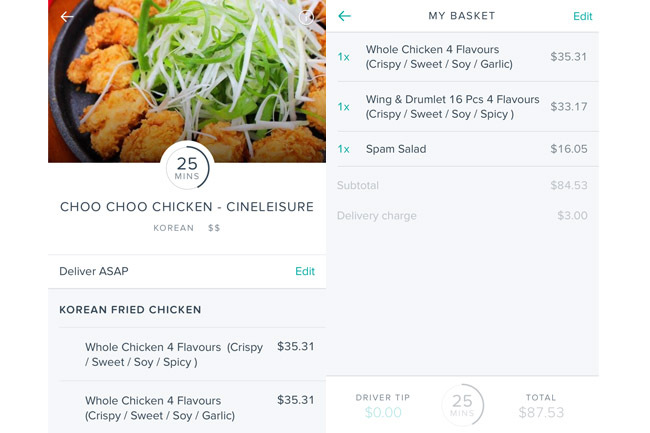 [Original Entry] First things first, food delivery is nothing new in Singapore, but Deliveroo is different. 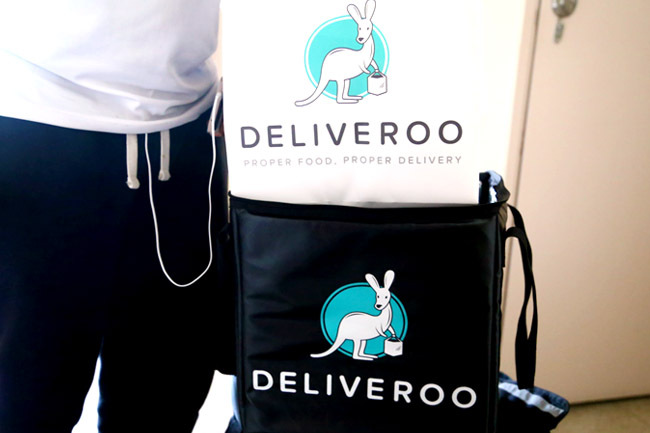 Deliveroo (easily identifiable by its cute kangaroo logo) is on-demand premium food delivery service that brings meals from restaurants to homes and offices. Yes, restaurants, in an average time of 32 minutes. I ALWAYS order delivery, for various reasons – corporate meeting, house party, family dinner, a pizza treat to my students (to reward them for good results), but it hasn’t always been all the time successful. From an end-user’s point of view, there are some common shortcomings in food deliveries – hard to call through, unreliable delivery timings, lack of food options. I think some of you may have been through that experience, and it can be extremely frustrating. 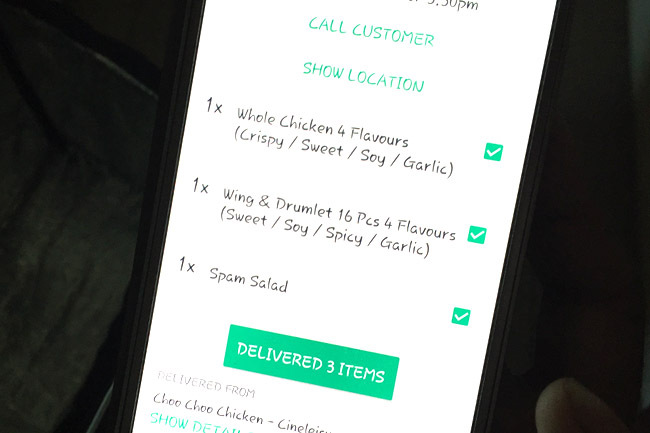 So before writing this post, I actually tried out Deliveroo 5 times to test their platform and services, and therefore feel safe enough to recommend to my colleagues and friends. Especially when I know I won’t want to jeopardise the meeting with THE BOSS when no food arrives. 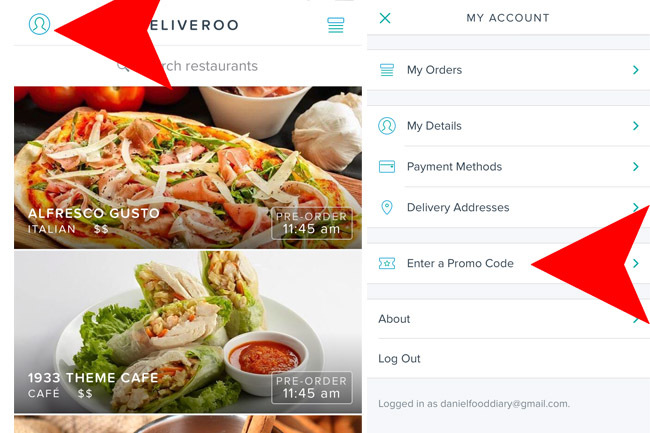 – Go to Deliveroo’s website www.deliveroo.com.sg or download the app Deliveroo on your mobile. – Type in your postal code into the landing page or screen. I used the app, so it is location based. – Select your preferred restaurant. – You can choose “Deliver ASAP” or up to a day in advance. The average time is supposedly 32 mins. 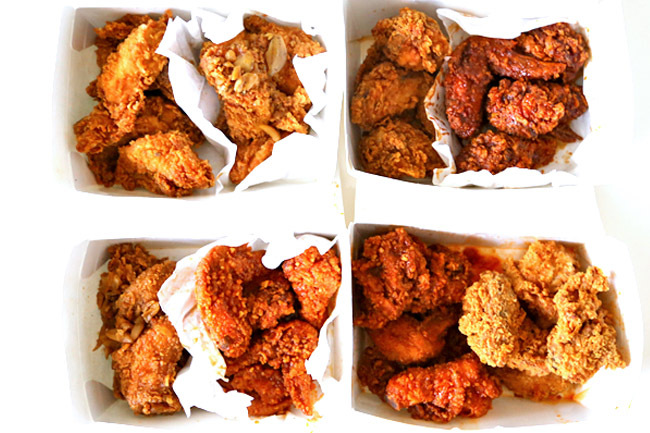 Needless to say, a hot, crispy and satisfying meal. We did order a lot, but guess we were hungry. 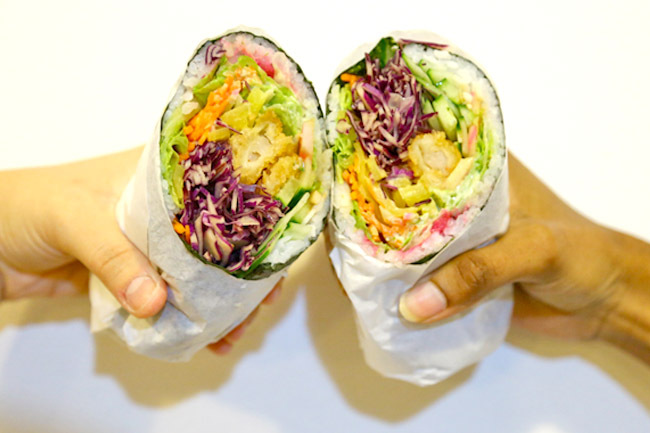 In another occasion, I ordered Sushi Burrito’s Rainbow Shrimp Sushi Burrito and P.S Cafe’s Truffle Fries with a variety of cakes for an office meeting. 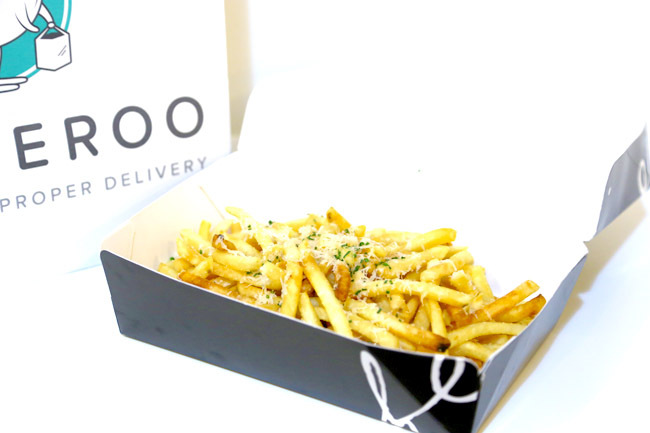 Yes, having TRUFFLE FRIES for your next team meeting can become a reality. And suddenly, you may just LOOK FORWARD to your next meeting. Those cakes you see here arrived in about 20-25 minutes or so. Delivery charges are only $3, and it really saves us the hassle and a lot of time going down to get food and back. 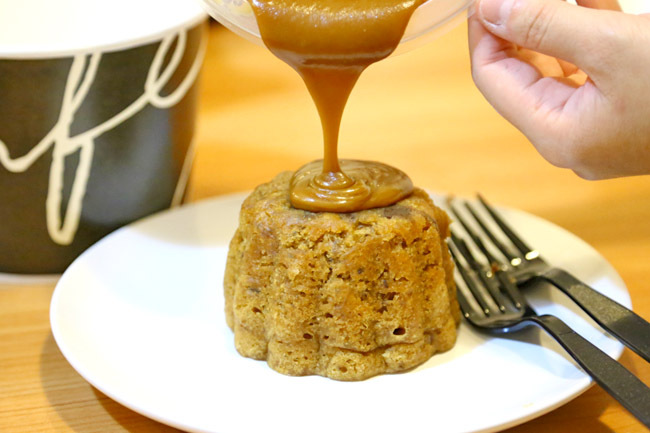 My colleague actually noticed that the Sticky Date Pudding came with the sauce separately packaged, so that the dessert doesn’t get mushy during delivery, and you can pour the amount to your fancy. P.S. 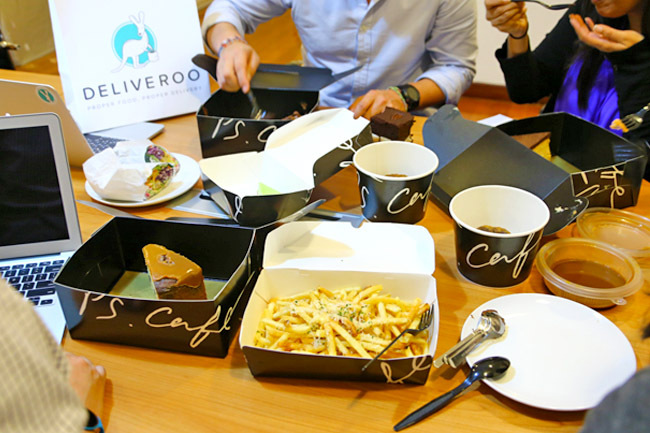 Cafe also provided the cakes individually in boxes, with utensils and serviettes. Plus points for service. 1. Deliveroo is established in London and uses a proprietary technology and logistics platform. Everything is done online – cash-free, convenient, fast. 2. 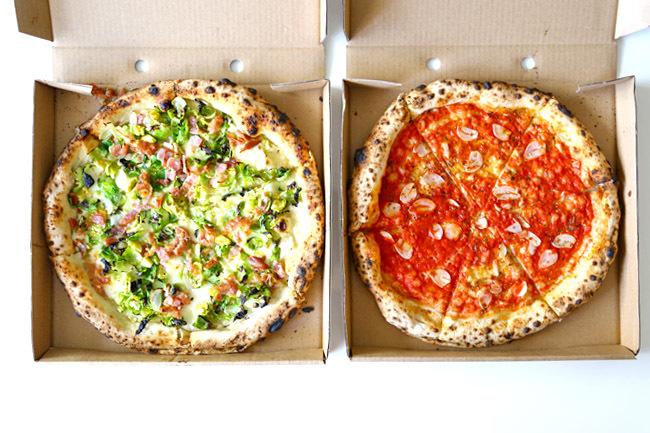 Meals are delivered from a wide selection of independent, curated, good-quality restaurants. 3. 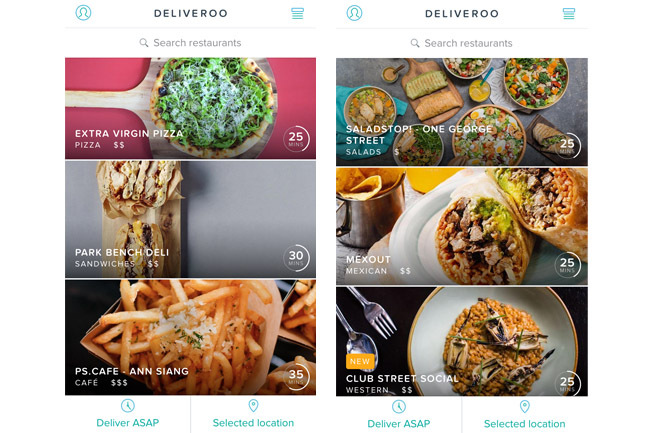 Deliveroo in Singapore features more than 300 restaurants currently, including Cedele, Chopsuey Cafe, Kinki Restaurant, MEATliquor, Potato Head Folk and PS. Cafe Petit. 4. “The only thing you will not find on Deliveroo is low-quality takeaway restaurants.” This is stated in their website. NO low quality takeaway restaurants. 5. 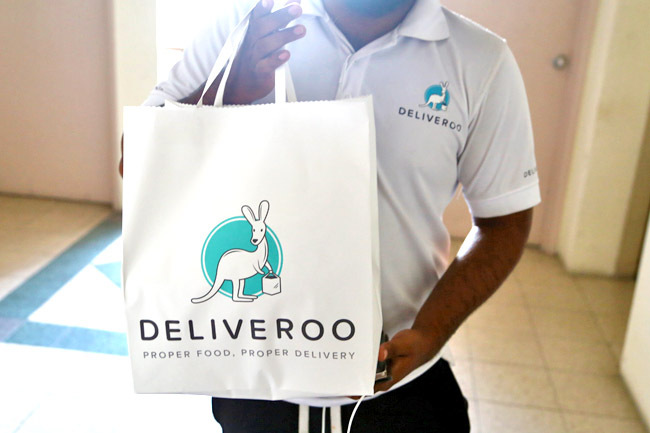 Deliveroo services customers in eleven zones across Singapore, mainly in Central Business District, Katong, Bukit Merah, Novena, Bukit Timah, Queenstown, Ang Mo Kio, Bishan, Serangoon, Bedok, and Kallang. This will expand to twenty zones by the end of first quarter 2016. 6. There is no minimum order. 7. A flat fee of $3 is charged for each delivery for any orders. For orders less than $25 – a surcharge of $5 is charged on top of the $3 delivery fee. 8. The average delivery time is 32 minutes. 9. 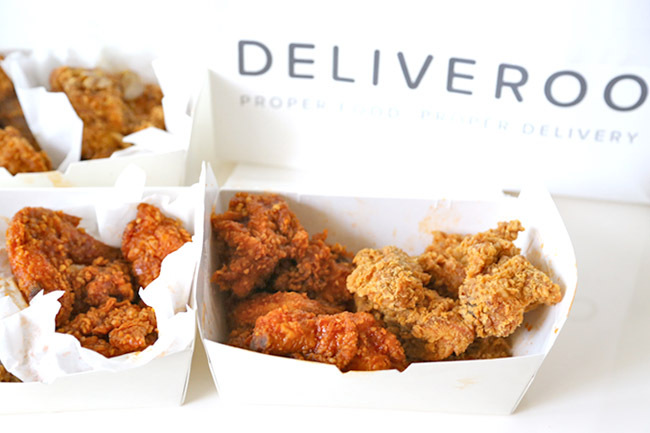 Deliveroo delivers every day from 11:30am to 11pm. 10. The drivers are called Roowomen and Roomen. We also learnt that the Roowomen and Roomen are in charge of this particular zone (thus more familiar with the district, shortcuts, traffic conditions etc). We are likely to see familiar faces if we order regularly from the same zone. This. Evidence of what happens when you are too hungry, and lazy to go out. Tea break time and this awesome Kong Bak Banh Mi came delivered by Deliveroo. Look at that fatty braised pork belly. Ordered 3:30pm. Arrived 3:51pm. In my tummy by 4:00pm. I am a Deliveroo convert. 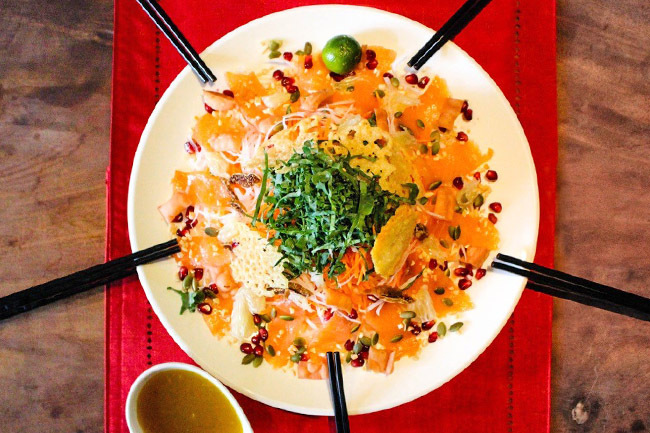 Spruce Yusheng decorated with smoked salmon, mandarin orange pieces, drizzled on the olive oil, and champagne vinaigrette dressing. Homemade with mix of auspicious ingredients including smoked salmon, baked parmesan crisps, shredded kale, pomelo, pomegranate seeds, radish, carrots, dried fig; with a medley of sesame seeds, chopped almonds and pumpkin seeds. Dressing is made with yuzu, lime, apple cider and honey. Deliveroo will also be giving out 88 Golden Ang Baos worth $88 each to 88 lucky winners. The Golden Ang Baos will be randomly dropped into the Rooman or Roowomen’s delivery bag before one picks their order up. Hope you win! *Great news! 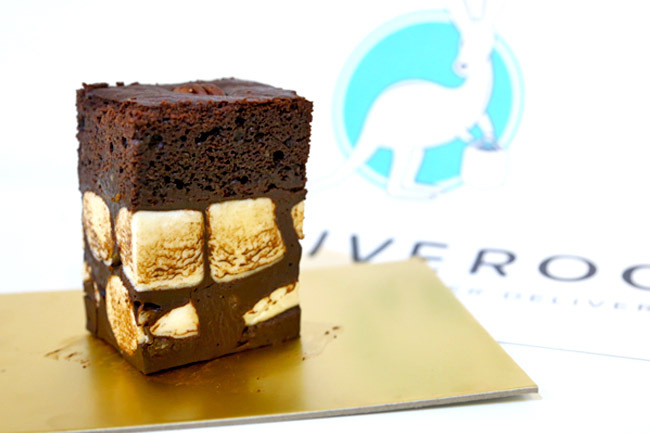 Order via Deliveroo and get $20 off your 1st order. Till 14 Feb 2016. * This entry is brought to you in partnership with Deliveroo. They only serve limited location. Yays! I was hungry and I saw your post and I went to order! Woohoo! So how was the experience like? Got use the promo code? haha.